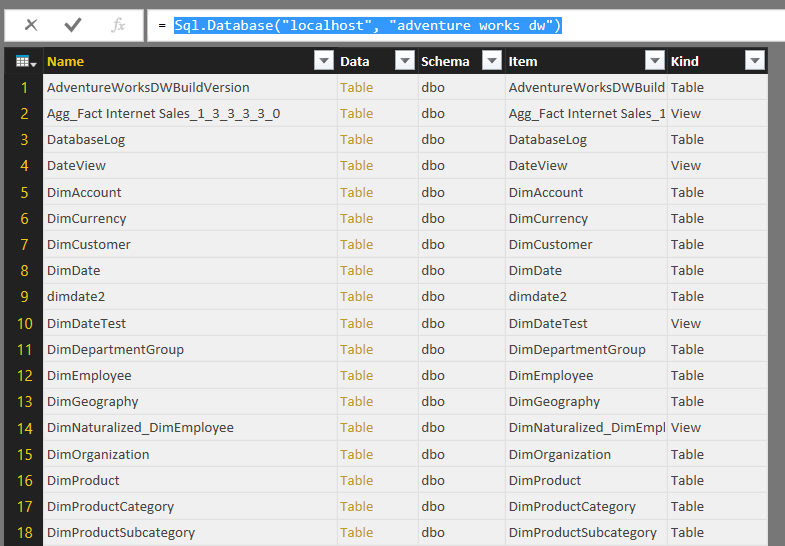 Basically, what it does is return all the relationships between all of the tables in a data source such as SQL Server. The documentation is a bit cryptic but I worked out what it does. Useful if you need to report on the structure of a database, I guess. It’s a shame that this isn’t available in Power Query in Excel yet (it isn’t as of September 2015, I assume it’s coming soon) because it would be cool to use this data with NodeXL. 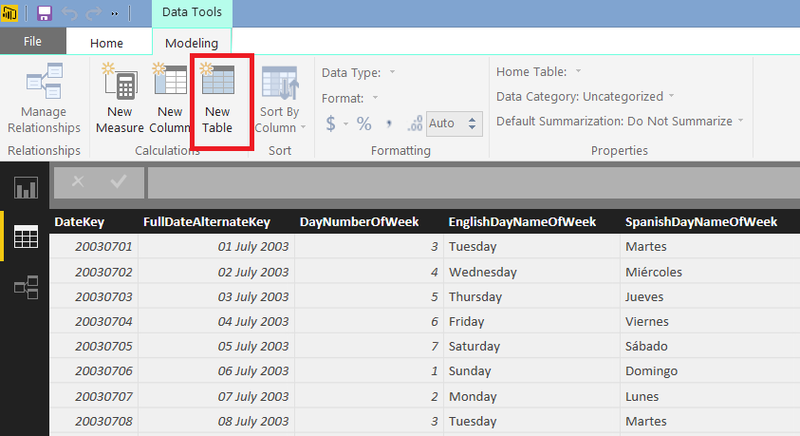 There are loads of great new features in today’s release of Power BI Desktop, but for me the most important by far is the introduction of calculated tables. Miguel Llopis gives a good introduction to what they are in the post announcing the release, but I thought it was worth going into a bit more detail about what they are and why they’re so useful. 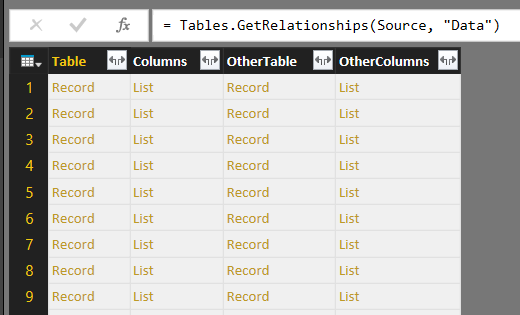 Calculated tables are created when the data in the model is refreshed (like calculated columns), and after that behave like any other table – so you can create relationships between calculated tables and other tables. You can also create calculated tables whose DAX expressions reference other calculated tables. They do take up memory like other tables too, so over-using them could be a bad thing. Why are calculated tables useful? Miguel’s blog post already lists some of the scenarios where calculated tables are useful, and I can already think of lots of practical scenarios where I’m going to be using them myself. Role playing dimensions are one obvious use: in a lot of models you need to use the same dimension table more than once in different places, with different relationships and maybe with different filters in place. It might be that you have a single Company dimension in your data warehouse that contains all of the companies your organisation does business with; with calculated tables you only need to import that table once, and you can then use calculated tables to create filtered copies of that table to use as Supplier and Customer dimension tables, joining them to your Stock and Sales fact tables, and only showing the relevant companies in each case. Certainly for debugging complex DAX expressions they’re going to be handy, because they allow you to see what DAX table expressions return. We’ve already DAX Studio for that but now we don’t have the hassle of switching to another application…! I can also see calculated tables as a way of doing certain types of ETL – which raises the question of whether you should do a certain operation in Get Data (ie what was Power Query) or using a calculated table. I strongly suspect that a lot of operations are going to be much faster with calculated tables because of the power of the underlying engine. It would be interesting to know if there are plans to allow Get Data to make use of calculated tables, for example as a way of buffering tables in memory, with M transformations folded back to DAX on those tables. 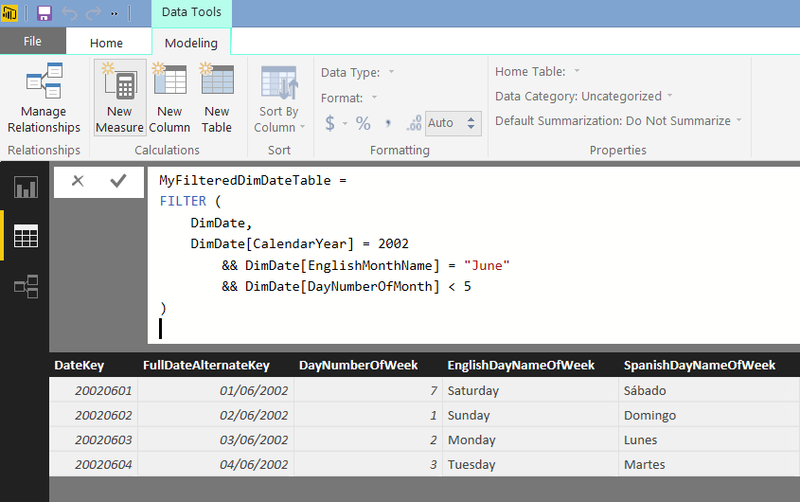 The CalendarAuto() function looks at all of the Date columns in all of the other tables in the model, and returns a similar table but one where the first date is the beginning of the year that contains the earliest date found in any non-calculated column in any non-calculated table, and where the last date is the end of the year that contains the latest date found in any non-calculated column in any non-calculated table. By default the beginning of the year is January 1st and the end of the year is December 31st, but there’s also an optional parameter to specify a different month to end the year on, if you want to create a fiscal calendar table. 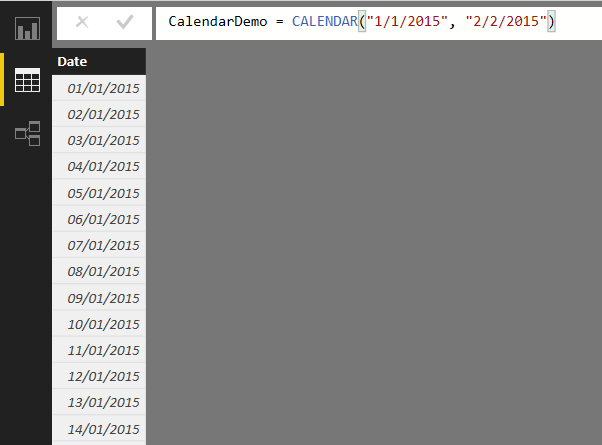 I wonder if we’ll get something like the functionality in Excel 2016 for creating date tables with other useful columns? Sometimes, when you’re working with a table of data in Power Query, you want to be able to get the value from just one cell in that table. In this blog post I’ll show you how you can do this both in the UI and in M code, and talk through all of the more advanced options available in M. Incidentally this is a topic I covered in some detail in the M chapter of my Power Query book, but since that book is now somewhat out-of-date I thought it was worth covering again in a blog post. 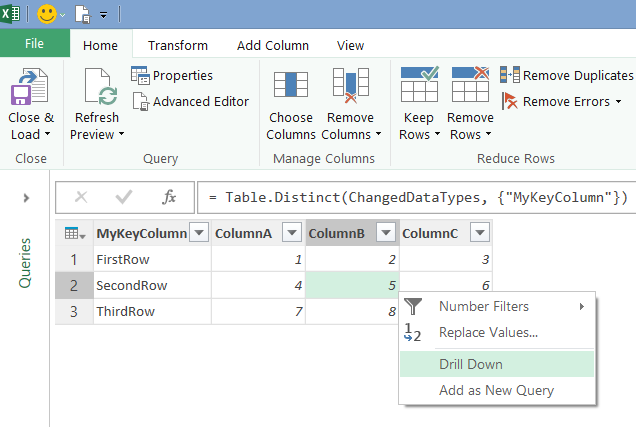 Note that this is the value 5, and not the value 5 in a cell in a table – a Power Query query can return a value of any data type, and in this case it’s going to return a single integer value rather than a value of type table. 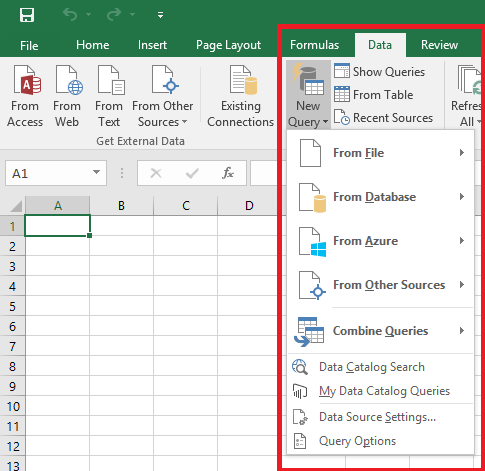 If you load the output of this query into Excel you’ll still see it formatted as a table, but if you’re using the output of this query as an input for another query (for example, you might want to read a value from Excel and use that value as a filter in a SQL query) it’s much more convenient to have an integer value than a table with one column and one row. returns the value 3, which is the value in the column ColumnC on the first row. As you’ll see in a moment, the order that the row and column reference come in could be important. 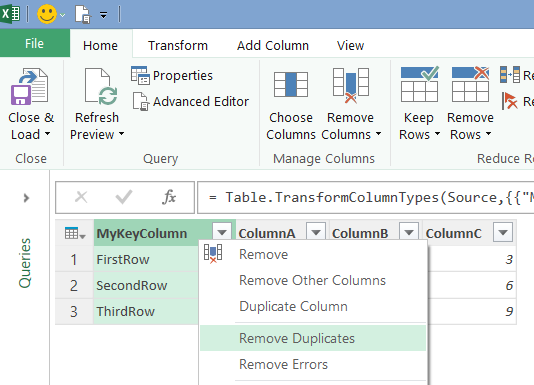 …will both return errors because there isn’t a fifth row in the table, and there isn’t a column called ColumnD. still returns an error, not because there isn’t a fifth row but because the reference to the fifth row returns a null value and there is no column called ColumnB in this null value. Unfortunately using ? won’t stop you getting an error if you use a negative value in a row reference. The presence of a primary key affects how the Drill Down functionality works, and gives you another way of referencing individual cells. (By the way, you can use the Table.Keys() function to see what keys are defined on a table in Power Query, and there’s an example query showing how to use this in the sample workbook for this post). You can still use the previous row number-based notation, but when a table has a primary key column defined on it you can also use a value from the primary key column to identify a row. Being able to reference individual values like this is incredibly useful for certain types of query and calculation. However, bear in mind that there are often many different ways of solving the same problem and not all of them will perform as well as each other. One obvious use of the techniques I’ve shown in this post would be to write a previous period growth calculation, where you need to refer to a value in a previous row in a table – but my experience is that writing calculation using row and column references prevents query folding and leads to poor performance, and an alternative approach (maybe like the ones shown here and here involving joins) often performs much better. There aren’t any general rules I can give you though, you just need to make sure you test thoroughly. A month or so ago, before I went on holiday, I was working on a really cool MDX idea that involved the Axis() function. Unfortunately I’ve forgotten what that idea was but while I was working on it I did find out something interesting about the Axis() function – namely that it doesn’t do exactly what the documentation says it does. Here, I’m using the SetToStr() function to take the set returned by the Axis() function and display it in a calculated measure. As you can see from the screenshot, I’m showing all three members from the Gender hierarchy on the Customer dimension on rows and the set returned by Axis(1) is indeed that set. Why is this interesting? The calculated measure FIRSTMEMBER returns the unique name of the first member in the set returned by Axis(1), which should be the first member shown on the rows axis. The calculated measure TEST returns null if the currentmember on the Gender hierarchy has the same unique name as the member returned by FIRSTMEMBER. The calculated measure TEST is on columns in the query, and on rows we get all the members on the Gender hierarchy that return a non null value for TEST. Since only Female and Male are returned, the All Member on Gender must return null for TEST, which means that the All Member is the first member in the set returned by the Axis() function. So, to summarise, the Axis() function actually returns the set of members on an axis the current query before any NON EMPTY filtering is applied. Power View is still Power View, but as John White points out here it is no longer visible on the ribbon by default, hidden from new users, although it’s easy to add the Power View button back onto the ribbon. 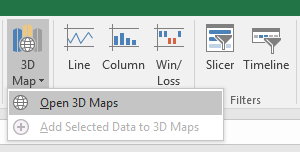 Power View in Excel 2016 is unchanged from Power View in Excel 2013. Read into this what you will. Clicking this button opens the Power Pivot window. There’s a subtle distinction between Power Pivot the add-in and the Excel Data Model (which is the database engine behind Power Pivot, and which is present in all Windows desktop editions of Excel regardless of whether the add-in is enabled or not) that has existed since Excel 2013 and which is generally unknown or misunderstood. The fact this button is titled “Manage Data Model” rather than “Power Pivot” is telling. The ‘Power’ prefix was intimidating for regular Excel users, who thought it represented something difficult and therefore not for them; it also made it look like this was functionality alien to Excel rather than a natural extension of Excel. Having separate Power add-ins led to a disjointed experience, rather than giving the impression that all of these tools could and should be used together. It also made comparisons, by analysts and in corporate bake-offs, with other competing tools difficult – were the Power-addins separate tools, or should they be considered a single tool along with Excel? Previously there was a lot of confusion about whether these add-ins are anything to do with ‘Power BI’ or not. Up to now, depending on who you talked to, they either were or weren’t officially part of Power BI. Now there is a clear distinction between Excel and Power BI, despite the close technical relationships that remain. The new names certainly address these problems and on balance I think this change was the right thing to do, even if I was quite annoyed when I first found out about them. There are significant downsides too: for example, changing the names means that several years of books, blog posts, articles and conference presentations about Power Query and Power Map now won’t be found by new users when they search the internet for help. Similarly, it won’t be obvious to new users that a lot of content is relevant for both Power BI Desktop and Excel. 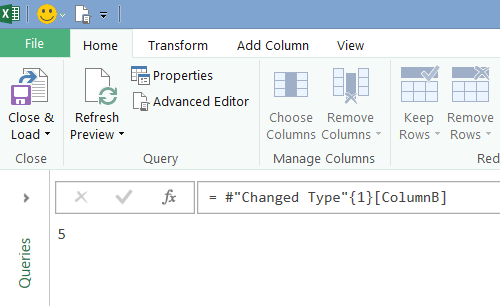 Now that the Power Query name has been de-emphasised, why should anyone looking at my old blog posts on that subject know that what I’ve written is still relevant for Excel 2016’s “Get & Transform” and Power BI Desktop? 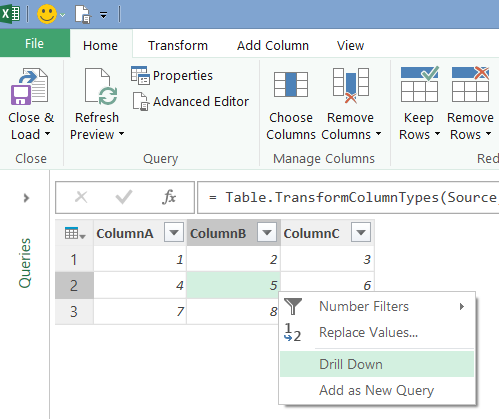 What would I call a second edition of my Power Query book, if I wrote one, given that Power Query exists only as the relatively nondescript “Get & Transform” in Excel 2016 and “Get Data” in Power BI Desktop?